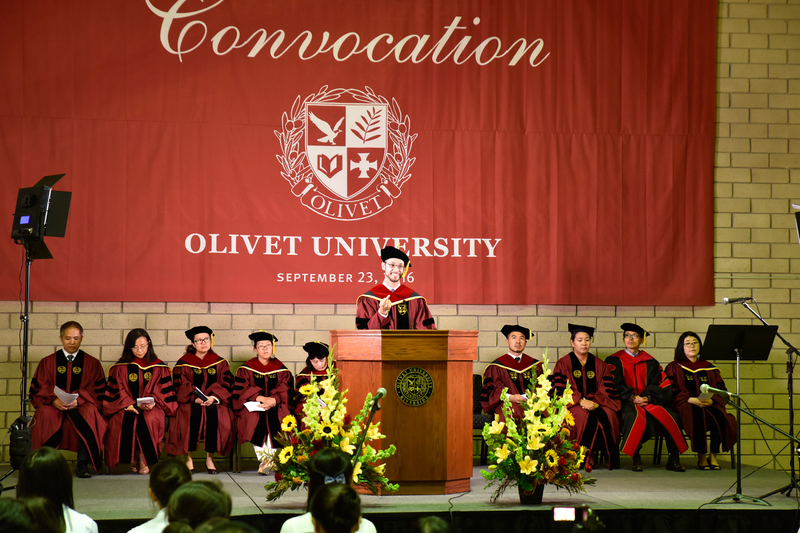 On September 23, 2016, Olivet University held its Fall Convocation services on campuses nationwide. Riverside, Dover, and San Francisco campuses each welcomed the new academic year with praise, prayer, and encouragement, while challenging new incoming OU students to make the most of their time as students. Welcome addresses were led by various school officials. President Dr. Tracy Davis welcomed students in Dover, Dr. Matthias Gebhardt greeted students in Riverside, and Dr. William Wagner addressed students in San Francisco. In previous years, only one convocation was held, but from the 2016 academic year onward, the school will hold separate ceremonies at each of its major locations. The atmosphere at the convocations was hopeful this year, as the many works of the Holy Spirit are evident throughout our campuses. Our growth, not only in student numbers, but in the improvement of our properties and facilities, is the blessing from God. In San Francisco following the convocation, the professors had a pizza fellowship with new students in order to meet them, and though far apart in culture, language, and age, they were able to unite with the shared heart to do the work of Christ. May Olivet University bear many fruit for the Lord in this academic year of 2016. May we be a testimony to the goodness of God that is revealed through the triumph of Jesus Christ on Calvary, declared unto the ends of the world.